One of the most memorable items in a sensory room. A proven, mesmerizing focal point. Constant, controllable bubbles float to the top. Colors and movement create instant interest. Clients of all functioning levels are sure to observe and react. 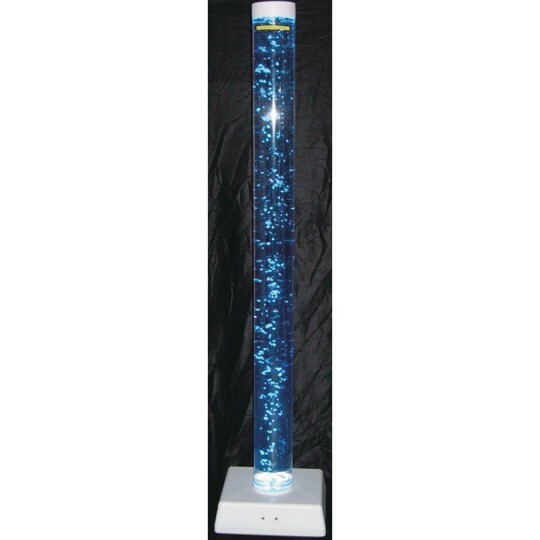 One of the most memorable items in a sensory room, bubble tubes have proven to be a mesmerizing focal point. Constant, controllable bubbles float to the top of the column through a wide range of colors, prompting clients of all functioning levels to observe and react. Colors and fascinating bubble formations offer a soothing visual, auditory and tactile experience. The tube is cool to the touch and also offers a slight vibration. Combine with the Bubble Tube Podium, below, for added stability and a comfortable sitting place to enhance the experience. Bubble Tube is switch adaptable. Input: 100-240V~47-63Hz 0.58A MAX. Output: 12V-2A 24W MAX. UL® approved. 68"H x 6" diameter.